Long journeys with the kids have never been so easy. 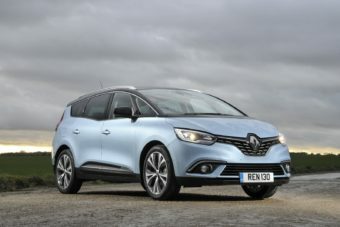 The new seven-seater Renault Grand Scenic Estate is an impressively stylish offering that’s well-equipped, affordable to run, and super spacious. In many ways, it’s the perfect family car in 2017. It’s the biggest MPV sold on these shores, but despite its size, it looks visually compelling. There are plenty of engines to choose from, including a hybrid, while its cabin is a pleasant place to spend your time on the road. OSV takes a closer look at what it’s all about with our 2017 Renault Grand Scenic Estate review. It’s a large car, so you’ll be forgiven for getting behind the wheel without high hopes. However, the Grand Scenic Estate might just surprise you with how competent it is on the road. It’s not what we’d call sporty, but it’s a pleasure to drive. There will be body roll if you enter corners with too much haste, but for the most part the car feels confident and sure-footed. Our only real criticism is its 20” alloys. There are no alternatives, they look great and they make the ride firmer than it would have been on smaller ones. There are a handful of diesel engines to choose from. The 1.5-litre dCi unit develops up to 110bhp, and can get you from rest to 62mph in 12.4 seconds. This number doesn’t change if you choose the 7-speed automatic transmission, or stick to the 6-speed manual. The 1.6-litre dCi 130bhp diesel is strictly manual. It’s quicker than the 1.5-litre diesel, and can do 0-62 in a sprightly 11.4 seconds. But while that extra power makes it more relaxing to drive, it makes a fair old noise when you rev it. Moreover, the manual ‘box is a bit jerky. A 1.6-litre 159bhp diesel is the quickest of them all, and will get you from a standstill to 62mph in 10.7 seconds before maxing out at 124mph. It’s a strong and willing power plant, but its 6-speed automatic transmission lets it down somewhat by making some rather odd responses. A turbocharged 1.2-litre engine is your sole petrol option, but it comes in two power guises. The 113bhp variant might be too slow for a lot of you, as it takes 13.0 seconds to dispense with 0-62. But while the 128bhp variant covers the same gallop in 11.9 seconds, it’s likely to be a niche option. The hybrid engine has been described as a “mild hybrid,” which means it doesn’t actually have an electric motor in the same way that a Toyota Prius does. Instead, energy is reclaimed and sent to a battery and power supply by braking. It makes it efficient, but we expect the diesels to be more popular. The Renault’s exterior is certainly stylish enough to set it apart from rivals, its angular design ensuring it looks bold and attractive in the showroom. If the people carrier is a dying breed, this one is prepared to go out with a bang. Inside, the cabin isn’t quite as exciting. But borrowing a lot of its cues from the Renault Megane is no bad thing at all. The smart design contrasts nicely with the dark plastics, with the Grand Scenic Estate feeling austere at times. It’s solidly put together, and standard kit is impressive. The centrally-mounted speedo of last time has gone, with Renault now adding digital instruments. This has both an advantage and disadvantage. Digital instruments are easier to use and help to smarten the dash up, but lower dashboard storage has been lost. 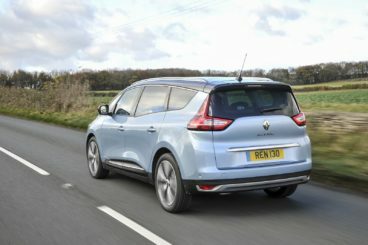 Is the Renault Grand Scenic Estate practical? Without a doubt. The interior is awash with space; three children can sit in the back without getting on each other’s nerves, and these seats can be slid back and forth with ease. 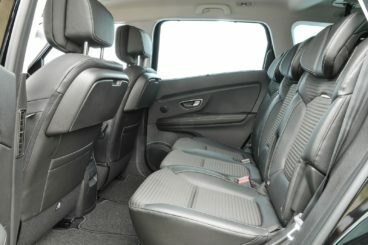 The extra two seats in the third row make it a seven-seater, but they can be folded away easily for more boot space. Access is easy, while the boot measures 595-litres with all seven seats up. Fold all the rear seats down, and you get a boot the size of what a van can offer (pretty much). Its lip is low, and its flat, square shape makes it easy to use. Standard kit is good, with all models getting 20” alloys, a 7” touchscreen, dual-zone climate control, a DAB digital radio, Bluetooth, a leather steering wheel, power-folding heated door mirrors, and roof rails. The Dynamique Nav model adds USB ports, all-round parking sensors, and ambient lighting. It also gets a bigger 8.7” portrait-style infotainment system. The Signature Nav model rounds things off with front fog lights, full LED headlights, power-adjustable front seats and black leather upholstery. In terms of safety, the car was awarded all five stars by Euro NCAP for its crash-test performance, and standard safety kit misses nothing. You get the likes of a tyre-pressure monitoring system, airbags, anti-lock brakes, ISOFIX child seat mounts, electronic brake-force distribution and autonomous emergency braking. Blind-spot monitoring is an optional extra. Prices for the new car start out from £23,445 and rise to £32,605. If you prefer to lease, you can pick up a deal from £265 + VAT per month. For more information on our leasing deals, check out our page here. In terms of its running costs, whichever model besides the hybrid you choose there’ll be a yearly road tax bill of £140 per year to pay after the first year (for which the exact amount of tax you pay is based on CO2 emissions). For the hybrid, you’ll be paying £130 per year after the first year. The 109bhp mild hybrid diesel is the most frugal overall, and can return 80mpg economy while emitting less than 100g/km of CO2. The 159bhp diesel, by contrast, returns 60mpg. That said, this is still a very good figure for this class. Cars in this market are usually best described as handsome, but the Grand Scenic Estate breaks the mould with a modern and friendly-looking design. The cabin is top-notch. It’s comfortable, great to look at and easy to use. Ease of use is the name of the game here, and the Renault is as competent and confident as cars like this come. It’s a shame that insulation isn’t better, as this can disrupt your enjoyment on longer journeys. There will be body roll, and the noisy diesels sometimes combine with harsh suspension for a not-too-pleasant experience. Let’s see how the car measures up against its rivals in the comparison section of our 2017 Renault Grand Scenic Estate review. 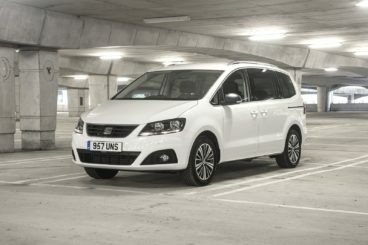 The new SEAT Alhambra Estate is probably the worst-looking SEAT on the market. On the plus side, it’s versatile, practical and comes well-equipped. It’s not always easy to make a people carrier look good – and SEAT has totally failed. However, it’s not always easy to make a people carrier easy to drive, but this is where SEAT have succeeded. The Alhambra is both comfy and fun. Its steering is well-weighted and precise, there is hardly any lean in bends, and there is a pile of grip on offer. There are even more entertaining rivals out there (see below), but this is not far behind. In term of its engines, a 2.0-litre TDI diesel comes with either 148 or 181bhp. As expected, the former doesn’t cost as much to buy and is cheaper to run. The latter, on the other hand, is stronger and better able to cope with the Alhambra on a full load. Neither feels sluggish, though. Petrol choices? There is only one to choose, a 1.4-litre TSI that’s available with the S and SE trims. It’s a fantastic engine that never feels overwhelmed, no matter where you are or how many people are onboard. However, while that kind of willingness makes it an attractive proposition, it can only return 43.5mpg economy at best. Low-mileage drivers won’t be complaining too much, but everyone else will be more at home with the diesels. The 148bhp variant returns as much as 56.6mpg, while the 181bhp is good for 53.3mpg. Inside, the SEAT Alhambra is exactly what you probably expect it to be: Spacious and comfortable. It’s also got a bit of a taste for the upmarket side of things, and despite its firm suspension, ride quality is good. The dashboard is typically straightforward for a people carrier, and we love the large buttons and big, easy-to-see dials. The quality of the plastics is good, and all models get the brands Media System Plus infotainment system. Overall, the SEAT Alhambra is one of the most useful cars on the road. Its flexible seating layout is complimented by sliding side doors, there are seven seats, plenty of storage areas, and handy touches, such as the sun blinds on the rear doors. The boot, meanwhile, measures 267-litres with all seven seats in place. Fold the third row of seats, and the Alhambra has a luggage capacity of 658-litres. With a low load lip, a flat floor and a wide opening, it’s super usable. 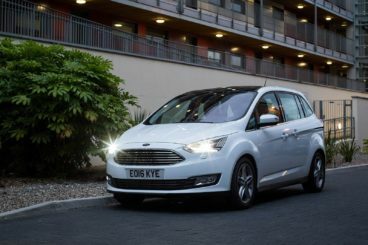 The new Ford Grand C-MAX Estate is the best car to drive, not just in this review, but in this entire sector. For a seven-seater, that’s a huge USP. Like a typical Ford, its steering is precise and responsive, and ride quality is pleasing. It might be a hefty vehicle, but it hides its weight well and body lean is minimal. The petrol engines aren’t actually that big, but they’re quick off the mark and ideal for towns and cities. The basic 1.0-litre petrol unit can’t quite muster 100bhp, and it does take a whole 13.6 seconds to cover the 0-62mph dash. But the 123bhp variant of the same engine does the same distance in 12.2 seconds and feels fine on a full load. The diesels are a better bet if you’re a high-mileage driver. A 1.5-litre TDCi unit kicks things off with 118bhp and a 0-62 time of 12.3 seconds. Pulling power is decent, and it’s likely to be a popular engine. A 2.0-litre 148bhp diesel is the quickest in the range by far, and can complete the 0-62 dash in less than 10.0 seconds. It’s a compliant workhorse that’s ideal if you’ll be spending a lot of time on the road. It’s economical too, returning 61.4mpg while emitting just 119g/km of CO2. The 1.5-litre 118bhp is the most frugal in the range, with its returns of 64.2mpg, while the 1.0-litre petrols both average 54.3mpg. Inside, the Ford Grand C-MAX Estate is surprisingly cosseted for such a well-handling car. Even on longer journeys we can’t imagine feeling the pinch of discomfort. Even better, insulation is excellent. The dashboard is typical Ford fare: Clean, well laid-out and smartly designed. There are soft-touch plastics here and there, while the instrument clutter is now less cluttered than its predecessor. And because the Zetec is the entry-level model, all models are well-equipped. The likes of air conditioning and a heated windscreen are standard. Unsurprisingly, the Ford Grand C-MAX Estate is also practical. It boasts pretty much the same dimensions as the Renault, and interior room is good. The seating layout lacks a bit of flexibility, because you need to slide the middle row of seats forward if those in the third row are to stretch their legs a bit. But at least you can do this. Visibility is excellent, the sliding doors make access in tight parking spots easy, and the boot measures 65-litres with all seven seats up. That’s poor, and you still only get 448 when the third row has been folded. Fold all seats and you get 1,715-litres of space. This seven-seater from Renault is a winner. If people carriers really are dying out, it’s certainly not for want of trying. Stylish, family-friendly and upmarket inside, the new Grand Scenic has everything we’ve always loved about big family cars. If you need something bigger than an SUV and want to keep running costs low, the new Renault Grand Scenic Estate is one of the best of the dying breed.